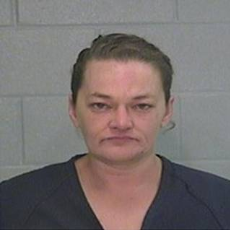 Police have arrested a 41-year-old woman in connection with the macabre theft of a deceased lady’s wedding ring during an open casket visitation in Odessa, Texas. The ring thief, identified as Kalynn Homfeld, was arrested on April 12 and charged with theft from a human corpse, a felony. Theft of a corpse, regardless of whether it’s $5 or $5,000 is still an automatic felony. The ring was stolen on April 8 and belonged to 88-year-old Lois Hicks, who passed away the day prior and was in her casket at the Sunset Memorial Gardens and Funeral Home. Vel McKee, Hicks’s daughter, said they had “only been gone for 15 minutes,”—and thats when Homfeld allegedly struck. After a little struggle, she took the ring from Hicks’ left hand ring finger—taking some skin with it—and quickly headed toward the exit. McKee noticed the ring was missing after tending to her mother’s hair and make-up later that day. Video surveillance of Homfeld’s shameless act went viral, which sparked internet outrage and a number of tips to be sent to local police. A day later, family members of Hicks told Odessa police the ring was made of plastic, and only worth around $10—but held significant value to Lois and the family because it represented her bond with her late husband, Gayle Hicks. “Even though the ring was a $10 plastic ring, theft of a corpse, regardless of whether it’s $5 or $5,000 is still an automatic felony,” Odessa police Cpl. Steve LeSueur told USA Today. Texas Public Safety Department arrest records indicate Homfeld is no stranger to jail cells and has several arrests dating back to 1999. Throughout multiple cities in Texas, Homfeld has been arrested and charged with a drug offense, a misdemeanor charge of prostitution, a DWI, evading arrest and several other offenses.